Put Up Your Dukes: halloween: come on, vamanos! well, we crushed it again. by "crushed it" of course i mean, went way over the top with our homemade costumes and made giant spectacles of ourselves. and it was amazing. a few of yall guessed right when you saw the sneaky peek of the the vest; which was diego's! chanelle actually named all 4 of our characters based just on that photo. stanley nickels to you, my friend! so we thought of this idea on sunday night and pitched it to the kids. 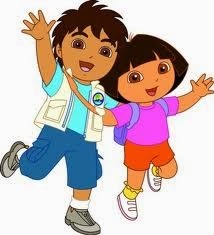 when they fully embraced being dora and diego, we knew the hard part was done. um, hi. yes. they are perfection. even down to the unintentional pose similarities. hair: $2 spray color from wal mart. diego's patch: printed from internet onto sticker paper. diego's vest: my crowning achievement, made from a foul $2 women's blouse from goodwill and an old set of cargo shorts. the blouse and the shirt i used to pattern the vest from. VEST believe (eh?) i didn't show judah what his vest was BEFORE, or he would have NEVER accepted it. and the final vest. i cannibalized some hand me down khaki cargo shorts for the pockets and the collar (i LOVED the style of the shorts but they were Sean John brand, and i think i'm not allowed to own that stuff?). added a nice industrial zipper from my stash and the official digeo patch. i love this thing and it will remain in the kids' dress up box until oblivion. boots the monkey and swiper the fox! yes. thank you. this IS real life and that is how we walked around in front of other humans (99% of whom, if over the age of 10, were NOT in costume). jesse and my costumes are pretty self explanatory. goodwill for the grey hoodie, and fox top and bottom (bottoms were ladies plus sized ahahahaha...rust is a hard color to find!) and then scrap fabric just sewn on in the right places. jesse's nose is cardstock and pipe cleaners. felt ears for both of us. judah being SO paranoid about his luscious locks being turned brown. he was concerned that he wouldnt look like a boy anymore (he has seen brown headed male children before, so i dunno), and then that the texture was all rough and sticky (as opposed to lush and silky per his usual). when we first arrived it was as it is every year for me: an utter stress meltdown and introvert's nightmare. i am already a little frazzled from a million last minute DIY additions to the costumes, am looking for someone to take pics for us as the light fades, my kids have been given emotional PCP/angeldust by the overstimulation of seeing all the people/costumes/games/rides, my husband is being mister extrovert and is method acting AS Swiper to anyone who comes near us, and i am trying to just get everyone inside and fed some hot dogs so that there is something to wage war against a case of the candy-evils in my kids stomachs. and just for fun, this year my uterus is summiting Mount PMS and is tricking my brain into lunacy as all this occurs. so of course when my kids begin wantonly disobeying my missives to follow me (WHY ARE YOUR SHOES OFF!?!?!) or stay close as we go check in, i have to discipline them. here comes the "my favorite" portion). 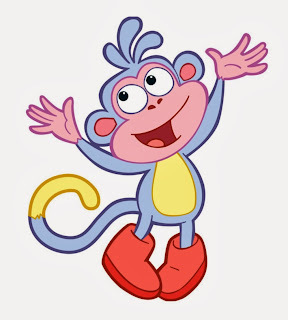 just imagine all the onlooking children who were likely traumatized for life by a big mommy style Boots the Monkey getting all stern and consequenc-y on Dora and Diego at church halloween party. ah, golden moment!. the opposite of favorite was the several incorrect guesses of our costumes we got. i got one, "mommy, look, a Teletubby!" and jesse got several "hey, what does the fox say?" unacceptable. for the most part though, people TOTALLY got swiper. jesse hammed it up to the max and attempted to swipe any kid's candy who told him "no swiping!" he even tricked judah and swiped and ate a bite of his pepperoni pizza while in character. judah was NOT AMUSED no matter how much jesse said, "i'm swiper! thats what i do!" judah kept saying, "no DADDY [would not call him swiper while offended], dont eat my pizza!" ok, boundary discovered and noted! Put Up Your Dukes does not condone or support the above treatment of baby jaguar. Diego has issued an apology and will be attending sensitivity training. washing the kids hair our was so gross and yet pleasing. i made the mistake of giving layla a bath and when her shampoo foam started spewing chocolate milk bubbles, i knew the tub was soon to follow in browness. judah took a shower so they wouldnt end up with a soaked-in tan from supersaturated brown tub water. (the spray in stuff washed out super easy with only one shampooing. that stuff was SO worth it). when i brought home jesse's gloves i was so excited to have found perfect purple gloves at goodwill for $2. and then jesse started complaining that they were the wrong color and swiper's stuff was blue. i totally disagreed and thought violet at most. we stubbornly both agreed to disagree on the color and just decided, purple would have to do since it was what we had. as i was making the swiper headband thing, judah came in and, 100% unprompted, goes (with jesse within earshot) " mommy, let me show you what real blue looks like" as he brought me a blue marker. fair enough, boys. happy halloween from a bunch of lunatics! 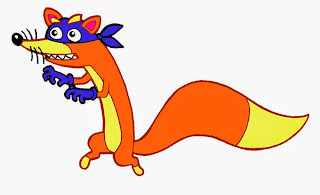 if youre wondering: where was swiper's tail?! you are not alone. in what had to have been the low point of our marriage, we got in a HUGE fight about a damn cartoon foxtail. there was no tail, everyone still recognized him as swiper, and we are still married. maybe this is all we need to know. ok so this was year #5 of this malarkey. can we officially retire now? So great! And nothing like a little PCP/angledust to make m'boots really, truly traumatizingly disciplinary to her brown-headed children. the best. Just the best. stanley nickels, being called a friend and personally mentioned in your post, what more could i ask for? and no, you may not retire....until the kids are at least 18. rock on. It's indigo... which is a purply blue. Amazing!!! Loved all your stories and the realness of it all. The hair dye sooo brought me back to my childhood, who can forget the mattted hair and that smell! I loved this so much, the making, the memories, the mayhem--so you, AND so like you for naming and claiming the parts that you're still recognizing as "NN" (Not Necessary). I'm thrilled that you guys decided on this as a family and YOU made it happen. Can't wait for Judah and Layla's creativity to kick in and help you create these gems. Can't stop now! Oh my gosh this made me laugh so epically hard. You are amazing!!! This year my boyfriend and I did a couples costume for the first time ever... we were Pat Sajak and Vanna White, and he wore a functional wheel we made out of MDF (with nails around the edges and a little pointer/flipper made out of plastic from a juice bottle) and I carried around a fully functional board with 5 different interchangeable puzzles (all time favorite being the classic before & after "MEMBERS-ONLY CLUB SANDWICH"). We got people pretty worked up playing Wheel of Fortune... I felt good about it.